"Being able to be a representative of IUPUI, this great university that is very different from a lot of places, kind of ahead of the game—it was really neat to be able to spread that word on a national level." 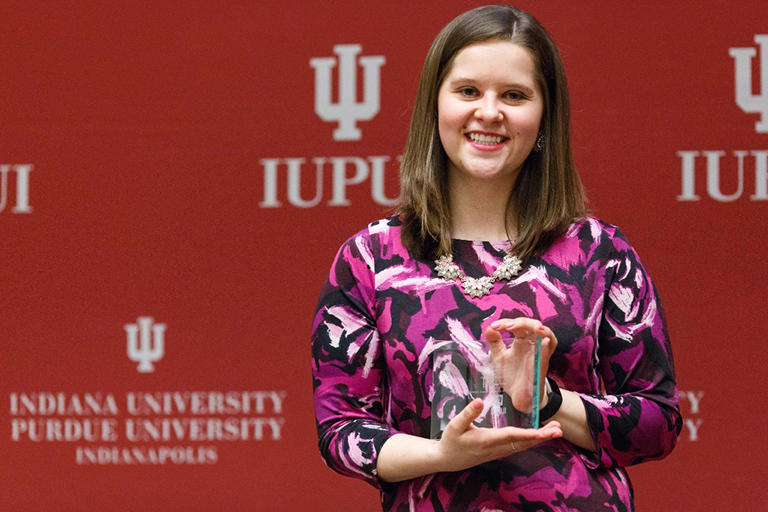 Kriech was selected from approximately 4,000 IUPUI seniors as the student speaker for their commencement ceremony, which will take place Sunday. She will join featured speaker Tamika Catchings, who played her entire 15-year professional basketball career for the Indiana Fever of the WNBA, onstage. To deliver the address at commencement, the student must have a successful academic record. Kriech will earn her bachelor's degree, with honors distinction, in organizational leadership and supervision with minors in business and sociology and certificates in technical communication and human resources management—and a history of campus and community involvement. Being able to be a representative of IUPUI, this great university that is very different from a lot of places, kind of ahead of the game—it was really neat to be able to spread that word on a national level. So over the ensuing four years, Kriech combined classes in global leadership, ethics, and project management with leadership positions on campus. She has served as vice president of membership for the Student Organization for Alumni Relations as well as director of entertainment speakers and vice president of external affairs for the Student Activities Programming Board. That's another theme in Kriech's career: building opportunities for others to enjoy the same success she has had. She developed two courses at IUPUI, including an upper-level grant-writing class based in part on her experience as a member of the State Farm Youth Advisory Board. In that position, which is what she was recalling when she lauded IUPUI for being ahead of the service-learning game, she helped to award $10 million over two years for youth projects across the United States and Canada. "I think what really caught my attention was being able to represent my department, my school, and the university," she said. It's kind of three different levels of giving back to this university that has given me so much, as well as the opportunity to give a good message send-off to my fellow graduates." Commencement begins at 1 p.m. on May 14 at Lucas Oil Stadium. You can find more information about the ceremony, travel information, and watching live online at commencement.iupui.edu.